Newport RI Animal Removal Services - Providing expert Removal of Bats, Squirrels, Skunks and Raccoons on Aquidneck Island. Call 401-846-3338 for service on Aquidneck Island or scroll down for local wildlife information in this area. BatGuys is a professional Wildlife Removal company in Rhode Island. We specialize in the removal and Exclusion of Bats, Squirrels, Skunks and Raccoons. The rapid development of land on Aquidneck Island has forced the native animals to adapt to life in the suburbs. This amounts to skunks under decks and porches, squirrel in gutters and attic, bats in chimnies and attics and raccoons in chimneys, roofs, attics etc. We specialize in the humane removal of nuisance animals, animal-proofing homes and businesses and cleaning and restoring the areas that were inhabited by the animals. Aquidneck Island is a summer home for the little brown bats. These bats are a migratory species. Each spring these little insect-eating machines arrive in droves as they follow the coastline up from the mid-Atlantic states. Starting in May we get calls for bats in attics and bat roosting in gable-vents and behind rake-boards from this area. These bats stay throughout the summer and usually depart in the fall as the nighttime temperatures start to dip into the low 30's. Visit our RI Bat Removal page for more info on bat removal in Rhode Island. Gray squirrels thrive on Aquidneck Island. These squirrels are found in great numbers from the agricultural lands off of East Main road in Middletown to downtown Newport. 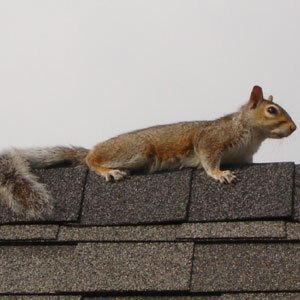 These Island Squirrels become a nuisance when they chew their way into attics and soffits. BatGuys provides squirrel removal in RI and all of Aquidneck Island. An interesting note on flying squirrels. We have never seen a flying squirrel on Aquidneck Island. Tiverton has a healthy population of flyers so I believe that they COULD survive in Portsmouth. I suppose if the wind was really blowing out of the north they could jump off a pine tree near the old stone bridge and sail across the Sakonnet river into Portsmouth. In the hundreds of squirrel and mice removal projects we have completed on the island we have never seen or trapped a flying squirrel. I have had some people tell me that they do in fact inhabit the island but I have never seen proof. If you have first-hand knowledge of flying squirrels on Aquidneck Island please email me. I'd like to know for sure if they do in fact reside on the island. Aquidneck Island has very healthy Raccoon population. Newport's coastline provides a great source of food for these animals. However because of the heavy development of this area the habitat for these animals is scarce. Raccoons in Newport are forced to reside in attics, chimneys, boat-houses and even in boats as shown in the above picture. Contact us at the phone number listed below for more information about Raccoon removal in RI. Please note that we do not handle dog and cat issues. For issues with domestic animals you can contact the Potter League for Animals.